14-year-old Felix Xaba dreams of becoming a jazzman like his late father, but his mother Lindiwe thinks jazz is ‘the devil’s music’. His world is turned upside down when he wins a scholarship to a private school. Felix leaves the comfort of the township, where his siblings and friends regard him as king of their world, to enter an elitist domain where he’s regarded as a pitiful nobody and where a gang of bullies, led by Junior Junior, makes his life a misery. Battling humiliation at school and his mother’s fierce ban on music at home, Felix finds comfort in the company of a drunken old busker, Bra Joe, who plays sax outside the local tavern. An audition notice for the school jazz concert is the spur Felix needs to overcome his loss of status. He defies his mother and turns to two aging members of his father’s old band to help him prepare for the school jazz concert. Together they embark on a journey where Felix not only learns to play the sax, but also about his musical roots and his father’s past. Directed by SAFTA Lifetime Achievement winner Roberta Durrant, Felix deals with issues of diversity and identity and is suitable for students aged 9 – 12. For further information about the film please click here. The Galway One World Centre is delighted to offer free screenings and workshops to primary schools in the West of Ireland as part of this year’s African Film Festival. Supported by SABIDO Productions and Concern Worldwide, the workshops will examine identity and diversity and are suitable for upper primary school students. Roberta Durrant graduated with an BA Hon degree in Drama and English from the University of Stellenbosch. In the early part of her career she acted in various television series in South Africa and feature films both local and international. She has performed and directed at the Young Vic Theatre and at the Edinburgh Festival. Since 1985 she has produced and/or directed many drama series and 3 feature films in South Africa. Most notably: Multiple iEmmy nominee Home Affairs,Sokhulu and Partners, and award-winning comedies such as: Madam and Eve, Stokvel and About Us. Roberta has produced two feature films, Inside Out, successfully distributed in South Africa by Ster Kinekor and internationally by Icon Entertainment, and Skilpoppe, based on the award-winning novel by Barry Hough and part of M-Net’s Local Movie of the Month initiative. 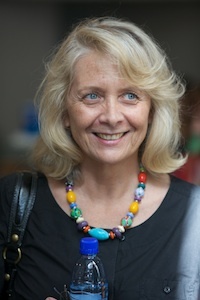 In 2012 she directed and produced the feature film Felix, winner of the Audience Choice Award at Durban International Film Festival in South Africa, the Lucas award for best film at the Lucas International Children’s Film Festival in Frankfurt, the Michel award at the Hamburg Film Festival, the Best Director award at the African International Film Festival in Nigeria, as well as two awards at the International Young Audience Film Festival Ale Kino in Poland: The Marcinek award for best full length film for children and the Teacher’s Jury Special mention award. The film also received Special Jury Recognition for being the first feature film by a director at the Pan African Film Festival in Los Angeles. She received a 2012 Lifetime Achievement award from the National Film and Video Foundation of South Africa.